As spring approaches, all manner of free food becomes available. 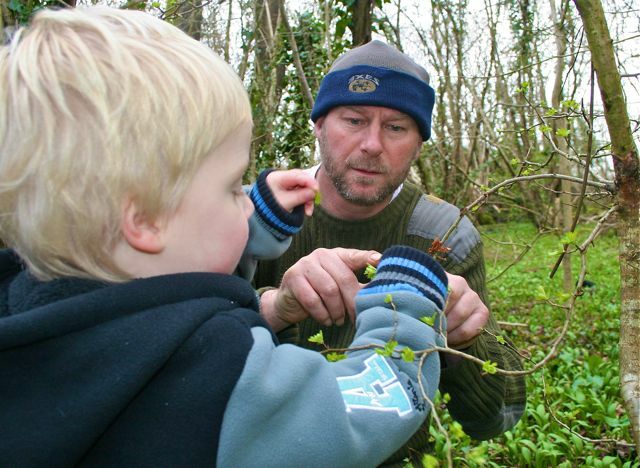 I took my son along to Stoke Park Estate in Bristol where local guide, Steve England, was running a morning foraging course to show what was on offer! Hoping to inspire my son, and also to come away with a bag of goodies, we headed over to the Cameron Centre in Lockleaze, just on on edge of the estate and where we met with the rest of the group. My son being three years old was the youngest and I did wonder whether he would actually eat anything, but full of excitement, and after a warm welcome from Steve, we headed on to the estate. Steve stopped us and explained that he would keep things simple for us as foraging can get fairly in depth, especially when it came to fungi. So we would be looking and tasting a few very simple and easy things to find. 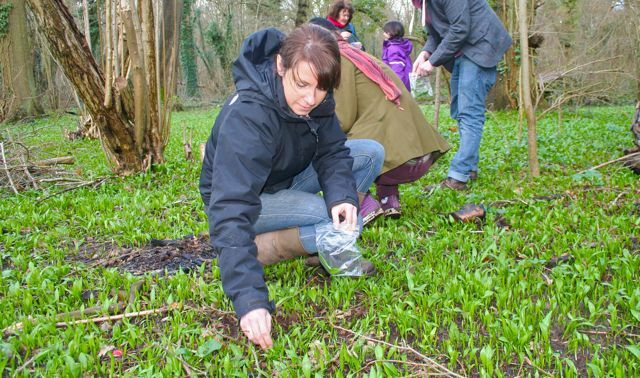 After being handed a few bags to store our foraged goodies we set out looking for our first meal, Crows garlic! Steve showed us what we were looking for and soon enough we started to find it everywhere. My son soon filled our bag up, and it amazed me as we actually have it in our garden! Next stop was below the bows of a birch tree where Steve had a strange set up of bottles strapped to the trees with small wooden plugs dripping birch sap in to them. I had heard about this before and was keen to try this, but to my surprise not as much as my son! He gulped it down like it was a fizzy drink! I drank my share and I can only describe if as a soft, sweet water. Very nice and easy to drink. Apparently, this drink can only be collected for a few months, just before the leaves appear on the tree. 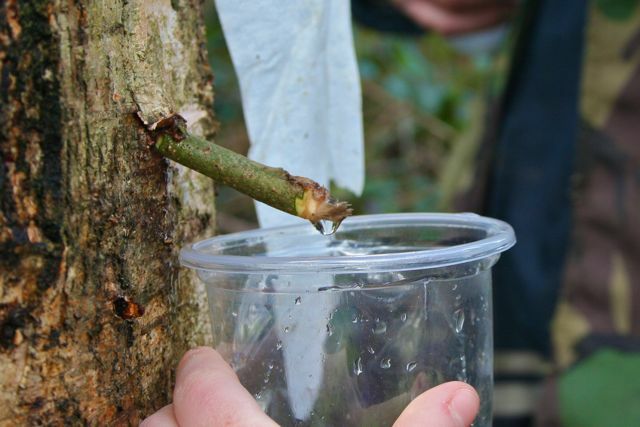 The water is sucked up through the tree, drawing all of the nutrients from the ground, filtering it through the trunk, and producing a bounty of mineral high sap. Steve also drove home the importance of plugging the tree afterwards to avoid damage and make the foraging sustainable. We headed in to the woods looking for wild garlic next and whilst there, Steve showed us the benefits to eating the fresh budding leaves on a hawthorn tree. My son was in there again, picking of new shoots and eating away. I was quite impressed. Some of this was down to Steve’s confidence in what he was saying and showing us leading up to it. After gathering a nice bag of wild garlic we sought out Ground Elder, apparently a weed brought over by the Romans, but probably my favourite find of the day. After returning home, this was the one thing I found went with every meal as a fresh salad leaf. The whole experience had been very educational, great fun and we came away with food! My son was asleep in the car on the way home, tired from all of the excitement, and on waking up asked when we could do it again!